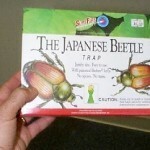 PRODUCT DESCRIPTION: This trap uses a pheromone based attractant which lures Japanese Beetles where the trap is located. 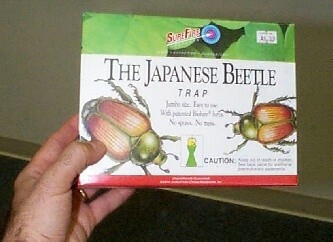 These traps are great to lure feeding Japanese Beetles away from plants and trees you are trying to protect. WHERE TO USE IT: AWAY from beneficial plants and shrubs. DO NOT PLACE THEM ALONGSIDE CLOSE TO HEALTHY DESIRABLE PLANTS AND GARDENS! The attractant is strong and will attract beetles which may miss the trap and inadvertently get onto the plants you are trying to protect. Trap placement should be as far away from beneficial plants as possible. RATE OF APPLICATION: In general, 1-2 traps placed in remote corners of your property are good locations. Use more when you have different zones of plants you are trying to protect. For example, if you have plants in the front of the house only, locate traps in the back of the house. If you have plants all away around the house that need protection, you will need to locate traps around the entire perimeter of your property with the intention of catching beetles before they find your plants.